Farm Fresh Food Finds This Morning Edition series takes you to America's farmers' markets and roadside stands for a sample of what's growing on its farms, in its gardens and across the countryside. We invite you to share your recipes and ideas. July 30, 2009  The small town of Rocky Ford, Colo., about 50 miles east of Pueblo, hails itself as the "Sweet Melon Capital of the World." That's because hot days, cool nights and a high elevation help farmers grow some of the sweetest cantaloupe on the planet. July 10, 2009  Chef Garrett Brown shows a crowd at a Seattle farmers market how to make savory and sweet dishes with cherries — which Washington state grows more than any other place in the U.S. On the menu: cold cherry soup and pork tenderloin with cherry sauce. July 16, 2009  Some summer foods beg to be eaten: fresh tomatoes, sweet corn on the cob. But one virtually screams, "Leave me alone!" Nopalitos are the pads of the prickly pear cactus. 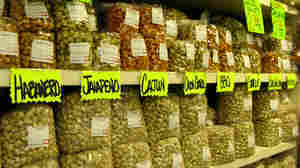 In Mexico and the American Southwest, they're a staple at farmers' markets. Ripe Figs: The Real Fruit Of Eden? July 23, 2009  Farmer Rick Knoll says it wasn't an apple that got Adam and Eve kicked out of the garden; it was figs. They're the sexiest thing there is, says Knoll, who grows seven fig varieties on his California farm. Knoll figs are fat and come to market oozing nectar. July 3, 2009  Some have tried to challenge Georgia as the "Peach State," to no avail. For Duke Lane Jr., who runs a 100-year-old peach orchard in Fort Valley, it's hard to beat the taste of a Georgia peach. People just know to look for Georgia peaches, Lane says. June 18, 2009  The edible flower of a zucchini is a delicate and ephemeral treat. Blossom fans at a farmers market in Washington, D.C., recommend them stuffed with cheese and baked, fried in batter or eaten raw. But prepare them quickly — they won't last longer than a day! June 5, 2009  Benny and Vickie Cox run a roadside stand in Ayden, N.C., called The Collard Shack. You won't find the green collards here that are common throughout the South. Instead, the Coxes grow yellow cabbage collards, an heirloom variety that's rare outside eastern North Carolina. May 29, 2009  Just after the snow melts but long before the last frost, hardy New Englanders take to moist meadows and muddy riverbanks in search of the fiddlehead fern. It looks like the scrolled top of a violin and tastes a little like asparagus. August 20, 2009  This is the time of year when Seattleites go foraging for their food. 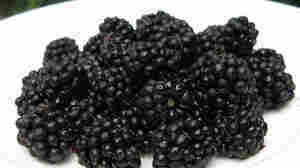 You see them in parks and along roadsides picking blackberries off the bushes that run rampant throughout the city. The state considers the bushes a "Class C noxious weed." August 12, 2009  Fresh fruits and vegetables may lure us to roadside stands, but it's hard to leave without stocking up on the weird regional snacks you can also find there. And if you're headed up to California's Sierra mountains, the best place to get your fix is at Pedrick Produce.